"This is so easy to make and more flavorful than store-bought. 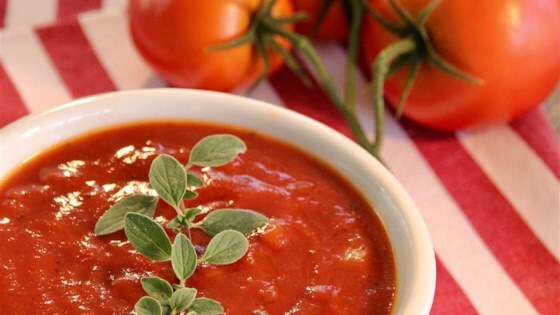 This sauce can be frozen and stored in single-serving portions." Heat olive oil in a saucepan over medium heat. Add onions; cook and stir until just starting to turn golden, 5 to 8 minutes. Stir in tomato puree, water, oregano, basil, salt, and pepper. Bring tomato sauce to a simmer. Reduce heat to medium-low; cover and simmer until flavors blend, about 30 minutes. This recipe makes enough sauce for 2 pizzas. I love this pizza sauce. It is so simple to make. Yet so very, very tasty!